Good location, old style feel, nice restaurant, and friendly staff. Comfy bed and great breakfast. The staff was really friendly and provided me a lot of informations about activities in the surroundings. Also it was great to have the possibility to rent some winter stuff like snowshoes. Overall cosy atmosphere. The location was also perfect for somebody like me travelling without a car, as it was close to the supermarket, restaurants etc., and yet it was in a very scenic spot. 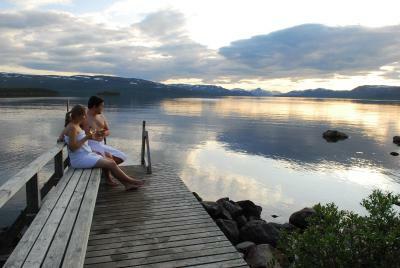 The sauna by the lake was great - and many people even dared to swim in the very cold crystal clear water! The friendly staff. The 100 years of Finland book in the room to read, it is so interesting. Great spot near the water and Saana. Can also travel very easily into Norway (15 min drive) from the hotel. Very good restaurant, both breakfast and a la carte. 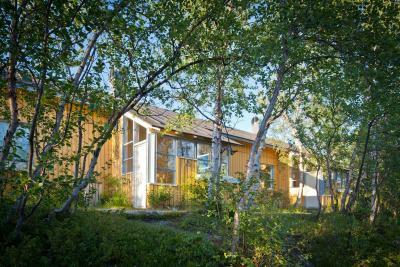 Sauna/access to lake at Lake Kilpisjärvi shore highly appreciated in the heat. Very friendly staff. Nice hotel at a prime location. We had a balcony to our room overlooking the lake. A clean, friendly place to stay even though the exterior looks a little worse for wear. A spacious but basic lounge area. I would definitely stay again.Sauna by the river, river is the plunge pool! Friendly and welcoming. Nice spa by lake, but lake toooooo cold for me. Beautiful views from lake, short walk (watch the mosquitos!) Restaurant dinner was gourmet quality, just excellent. Room basic but clean. Bath basic, clean and hot water. Saw several huge reindeer (one with huge rack) just by parking lot. Breakfast nice and staff all very friendly! Would stay again for sure! Lapland Hotels Kilpis This rating is a reflection of how the property compares to the industry standard when it comes to price, facilities and services available. It's based on a self-evaluation by the property. Use this rating to help choose your stay! 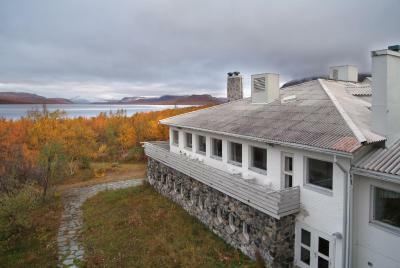 Located next to Lake Kilpisjärvi, Lapland Hotel Kilpis is 2.3 mi from Saana Fell. 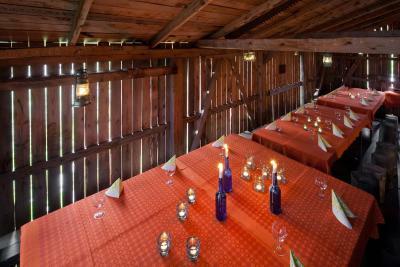 The property is surrounded by Finland’s highest peaks and the Finland-Norway border is only 7.7 mi away. 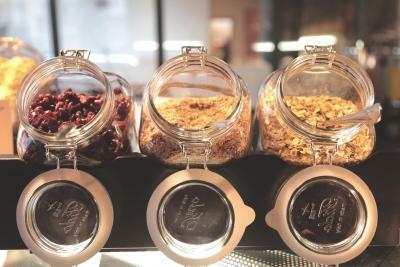 Guests can choose from hotel-standard rooms or a guest room in the hostel wing. Standard hotel rooms and apartments have a TV and private bathrooms. 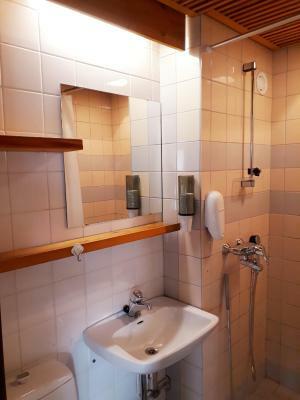 Guests in the hostel rooms have access to shared bathrooms, a TV lounge, guest kitchen and drying room for clothes. Lapland Hotel Kilpis has a large restaurant that offers views over Lake Kilpisjärvi to the mountains of Norway and Sweden. Skiing, hiking and fishing are popular activities in this area. The hotel can help arrange snowmobile tours and helicopter skiing. A shared sauna is also available. Treriksröset marks the point where the borders of Finland, Norway and Sweden meet. You can reach this point by a 6.8 mi trail from Lake Kilpisjärvi or via a ferry ride and 1.9 mi hike from the ferry terminal. When would you like to stay at Lapland Hotels Kilpis? This twin room has a private bathroom with shower. This studio has kitchenware, a stovetop and electric kettle. This hostel-standard twin room has a desk. The shared showers and toilets are located in the hall. This single room includes a hairdryer and TV. This triple room has a private bathroom with shower. This apartment features a sauna, stovetop and electric kettle. This apartment has a sauna. House Rules Lapland Hotels Kilpis takes special requests – add in the next step! Lapland Hotels Kilpis accepts these cards and reserves the right to temporarily hold an amount prior to arrival. How to get to Lapland Hotels Kilpis from "Tromsø Airport, Langnes"
Room is very basic and needs a major overhaul. Ceiling had cracks in it, as had the sink in the bathroom (was not leaking though), furniture was old, dark and massive and paint is chipping off. The most important things were clean (bed, bathroom), but there was dust on lamps and the ceiling beams in the bathroom. There was no tv (not necessary for us, but really standard in a hotel room nowadays) and power outlets were in inconvenient places. All in all the hotel scores on friendliness and comfortability, but it could be so much better if they would get new furniture in the rooms and give it a paint job. The look of the room now is a bit of a dissappointment to be honest. Friendly staff, breakfast was good. Slept very well, beds were comfortable. We had dinner once in the restaurant and it was wonderful. 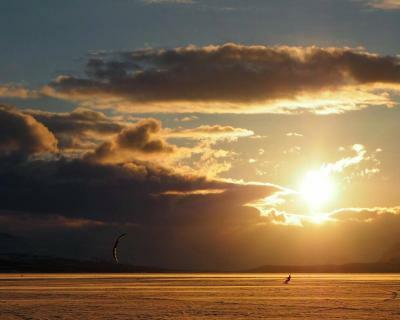 The location in Kilpisjärvi is great. Room is rather small and too warm despite turning off the radiators and opening the window. Hot food could have been hotter. The building and room is very old, facilities and furniture are quite worn. Bathroom is small. Too expensive for what it is. The staff are really friendly. Location is good. On the pricey side for a room with two single beds. Location ok,breakfast not too bad,rooms way out of date,nice staff tough.Only for staff,I would give 9+,other than that no worth of that money. If being lodged next to a disco doesn't make sleeping difficult, then the smokers discussing the choice of music at the top of their voices next to your window make it impossible to fall a sleep before 2:30 AM.